Do you ever feel ignored after sending out an email to people who’ve said they want to hear from you? Maybe you spent quite a bit of time crafting an interesting message or an exciting offer and still nothing. You can always blame it on the fact that most of us are getting a minimum of a hundred emails a day. It might also be time to ask yourself, is there something you’re doing in your email messages that are causing people to not respond. This last month, I’ve done multiple training courses on the topic of email. I had the great pleasure of speaking to an amazing group of women in Lake Geneva, WI on writing emails that covert. In the Sales Maven Society (my membership community), there are multiple trainings on the topic of email messaging including sample scripts to increase your response rate. It’s a hot topic since many of us communicate with our prospects/clients via email. There is, however, one thing people are consistently doing that is deterring people from responding to messages. 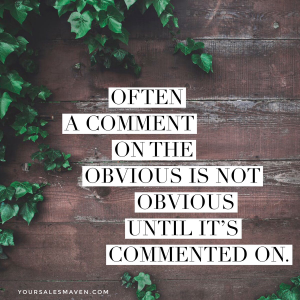 It’s something I notice often when reviewing and coaching my private clients on their messaging to prospects. Once I point it out to clients, they are often surprised at how obvious it is and more importantly, how simple it is to fix. You may also find it completely obvious once you become aware of it as well. The goal of sharing it is to offer you a way to create rapport and build strong relationships with clients/prospects. Although it may be obvious once you’re aware of it, it may also be a hard habit to break. You may begin to notice it when you read others’ emails, yet completely miss it when writing your own. It’s one of the reasons my private clients receive message reviews as part of their VIP package. The thing that makes it easy to ignore your email is that you’re writing them to the masses. When someone receives an email from you, they’re not standing around with everyone else who received the same email and all reading it together. They are just one person, reading one email from one person (you). Yet, often messages that you send out to your whole list are written as if the reader is just a cog in a wheel, a number, one of many. Who wants to be treated like they are just one of many? When people feel like they are just one of many, it’s easy to ignore your message. Maybe they assume, “someone else will respond”, ‘this message isn’t really to me”, or “you’re not expecting me to respond or take action”. You might not see how this applies to you. Maybe, you’re sure no one who receives messages from you feels this way. You take the time in your messages to show how much you care about the person reading it. These are all statements my own clients have made when I point out how they can improve their messages. The fact of the matter is, I agree, you do care about your prospects/clients, you want people to know you are interested in them as people and your intentions are good. And, if you’re taking the time to write a message, let’s be sure you’re doing everything you can to encourage a response/engagement by the other person. The person receiving the email is not standing around reading it with everyone else. So instead, address it to each person. Include their name in the email. This is something easily done with your list management service like Aweber, Active Campaign, Mail Chimp, etc. Do you see how someone might feel like they are reading a group message when phrases like this are used? It’s kind of like when someone sends a message through Facebook Messenger and they include 70 people all on the same message. We all know (or should know) by now, that is a social etiquette faux pas. It’s annoying and many of us instantly remove ourselves from the message. If it’s not ok to do in a message, it’s easy to recognize, it’s not going to be well received in email either. In case you’re struggling with how to rephrase your message to make it more personal and increase your response rate, it may be time to seek some expert advice. You’re invited to schedule a paid Strategy Session now. During this time we’ll work on improving your messages and increasing your response rate.